There's still some life in ya…right? This gray, realistic tombstone send the perfect message to your next victim on their birthday, or even as a Halloween surprise. 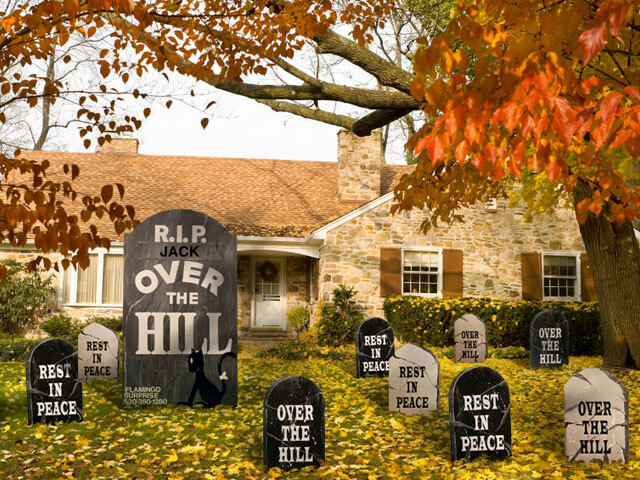 This "Over the hill" display will bury any old age stress six feet under the ground. Bill is looking grim for the old geezer. A moment of silence Jack is 50.
Who needs bats in a belfry when you have them on your lawn?!?! Need to tell that old buzzard something. Playing with children or reminding someone they are not extinct yet.